Aptly sourced in collaboration with the party paradise, Pikes Hotel in Ibiza the Gold On Rock Hand Wall Art & Coat Hook will liven up your walls… guaranteed! Forming part of our second product collaboration with the iconic institution, we have taken inspiration from the Pikes Hotel grounds and the iconic pieces that adorn Pikes to create a fun-filled homeware collection that party-goers everywhere will just love. Known for their eclectic and unique style and for the biggest, maddest parties at RSG we wanted to curate a range of pieces that reflected this fun, party spirit. 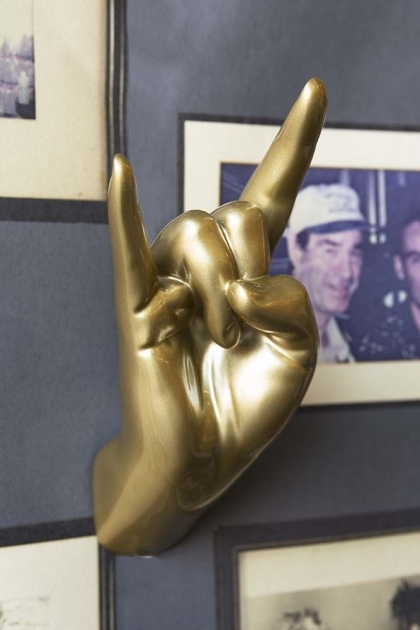 Our golden hand wall art pieces do exactly that! Available in four styles – Okay, Up Yours, Peace and Rock – there is so much suggestive fun to have with the eclectic storage pieces. Perfect for hanging your coats, hats and clothing on, but even better for creating a humorous wall display we think that the collection of Gold Hand Wall Art/ Coat Hooks would make a brilliant 3D addition to your picture of gallery wall. A fabulous gift idea too, our Gold Hand Wall Art and Coat Hook is the ideal gift for that special someone who loves naughty and out of the ordinary pieces. Projects 85mm from the wall.